This interview is the latest in an Accepted.com blog series featuring interviews with MBA students, offering readers a behind-the-scenes look at top MBA programs. And now for a chat with Jackie, a student at Northwestern Kellogg. Jackie: I’m originally from the Bay Area and moved out to beautiful, snowy Illinois for undergrad at Northwestern University. I did a lot of theater in high school but wanted to get serious in undergrad, so I started out as a pre-med / psych major. It wasn’t long before I was auditioning for student films and trying to get my fix of creativity, and I ended up transferring to the Radio / TV / Film department my sophomore year. I decided I wanted to become a producer, started producing student projects, and moved straight out to LA after graduation to chase that dream. I started out as an assistant as a reality TV production company and worked my way up from there, becoming a freelance Associate Producer, then a Story Producer. I’ve worked on shows for ABC, FOX, NBC, and other networks. 1. In my spare time, I’m a letterpress artist and create original posters and stationery using antique printing presses and lead and wooden type. 2. My internships before senior year of college involved being Eddie Murphy’s handler at a premiere party and cataloging paintings by Michael Alig, a familiar name if you’ve seen the movie Party Monster. 3. On the first day on my first show as an Associate Producer, I had to appear on camera and pretend to be married to our host (and pregnant!) so we could go undercover at an Outback Steakhouse to find out how they make their Bloomin’ Onion. It was as ridiculous as it sounds! Accepted: Where are you in b-school? What year? Accepted: Which other programs had you applied to? Why did you choose Kellogg? Is the program living up to your expectations? Jackie: I applied to Stanford GSB, Northwestern Kellogg, UCLA Anderson, NYU Stern, and UT McCombs. I think it’s important to spend your time only applying to schools where you would be genuinely happy, since it’s such a time-intensive process; I realized that my priority was to stay close to friends and/or family outside of the b-school bubble. I looked at programs that were near friends and family (Bay Area, New York, LA, Chicago) and that were known for their ultra-collaborative cultures. Once I had some target schools in that area, I narrowed the list down by looking at which programs were strongest for my interests (entertainment / media, marketing, and data analytics). When it came down to decision time, I was torn between Anderson and Kellogg. I’d been living in LA for seven years, and the thought of leaving my friends and community there was really hard for me. (Not to mention that my family lived just a few hours’ drive away.) Anderson is also an amazing school if you’re interested in going into media / entertainment – its proximity to the major networks and studios creates unique opportunities to intern during the school year to build your network. If I knew 100% that I was going to go back into entertainment, it would have been really hard to say no to Anderson. But! I had a feeling that if I went to Anderson, I would be as sucked into media and entertainment as I was in undergrad. I never gave myself a chance to explore other industries or jobs, and I wanted b-school to be an experience that broadened my perspective. So I wasn’t (and am not) 100% all in for entertainment. That’s when I started to lean towards Kellogg. Kellogg also has a great reputation as a marketing school and has a really strong data analytics program, which speaks directly to my interests (and is applicable across multiple industries). I came to Kellogg’s admit weekend before I had made up my mind, and that sealed the deal for me. Getting a chance to meet current students, take mini-classes with professors, and learn about the school and its administration (I’m a HUGE fan of our Dean, Sally Blount) made me fall in love with Kellogg. I believed deeply in this institution and wanted this to be where I came to learn. So far, Kellogg is definitely meeting my expectations in terms of class experience, its emphasis on collaboration, and how student-driven the school is. My professors are wonderful and engaging, and I often have a goofy smile on my face during class because I’m just so happy to be learning here. (It’s sappy, I know. But true!) The collaboration piece comes in through group assignments and the second-years’ attitude of giving back to us by mentoring us and making themselves available for even the silliest of questions. I’d also heard that Kellogg is very student-driven, and I’ve been really pleasantly surprised to find out how true that is. Students have a huge voice, and it’s exciting to know that as a student, you can leave a mark on the school. The parts of starting school that I find challenging (which aren’t Kellogg-specific) are juggling priorities and adjusting socially. I’d always heard that it was hard to manage your time and priorities at school, but I never thought it would be THIS hard. There’s always some awesome social event, or another club to get involved in, or…oh, I don’t know, homework to do? It’s been tough so far to get my footing in this hyper-overbooked environment. I also didn’t anticipate just how much I would miss the people from my pre-MBA life. Granted, we’re only a couple of weeks into the school year, but I for some of us, it takes a little time to feel completely at home in a new place with new people. I’m one of those people, and if you’re just starting your MBA and feel the same way, know that you’re not alone! The good news here is that everyone’s in the same boat, and I’ve found Kellogg students to be really wonderful, welcoming, and excited to learn about my background and pre-MBA career. 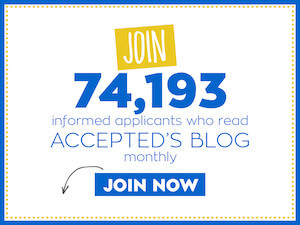 Accepted: On your blog you call yourself a non-traditional student — how so? Can you walk us through your journey of heading back to school after your career as a producer? Do your future plans involve media production? Jackie: I think of myself as a non-traditional MBA student because I did not have a business background in undergrad or in my career pre-Kellogg. I never thought that I would need to go back to school, but I realized a couple of years ago that I wanted to have more of an impact than I was having as a freelance producer. I thought about what job functions I would like, and I started to zero in on marketing. At the same time, I became fascinated with the rise of big data in entertainment and decided that I wanted to focus on that industry trend. Being at school as a non-traditional candidate is interesting. I’m still learning what unique qualities I bring to the classroom – so far, I think that I come with a unique set of collaborative skills and tools from working in a creative environment, and I approach problems with a big case of beginner’s mind, which can be helpful in looking at problems from new perspectives. Like many people at school, my career plans got a little less cemented once I got to b-school and started to realize how much there is out there. At the moment, my future plans could very well involve going back into entertainment, but in a marketing or strategy function instead of a creative function like I had before. I am also potentially interested in trying out different functions (like consulting or brand management) that would give me exposure to how things are done outside of the entertainment industry. Accepted: You did great on the GMAT the first time (690), and then even better the second time (750) — can you share some tips with our readers? Jackie: Oh, the GMAT. I don’t know that I have much wisdom to share about the test, but here goes! The next thing that I would say is to remember that the test is a measure of your abilities in one instance. It’s just one test, and it’s not reflective of your intelligence or how much you deserve to get into b-school. I actually had a little anxiety attack during my first GMAT experience, and I think a big part of the issue is that I really felt deep down that the GMAT was a measure of my worth. But it’s not! It’s just a measure of how good you are at taking the GMAT. A lot of the work I did between the tests was sharpening my quant, but I also spent a lot of time building up my confidence and getting my head game in check. My last piece of advice would be to be inquisitive and search for the best explanation for the concepts you may be struggling with. Probability was my mortal enemy on the GMAT – I just could not understand how to make sense of them, especially in two minutes! At Kellogg I’ve had to take an intro to statistics class that dealt with…you guessed it: probability! But I actually managed to figure it out this time, since our professor used a couple of different ways to explain it that finally clicked. I wish that I had taken the time to check out more resources in GMAT prep, like Khan Academy or different math sites. I think that’s pretty intuitive and natural for most people, but it wasn’t for me, and it’s something I would improve on if I were to go back in time and do this again! Jackie: I think that my greatest challenge in my application was nailing my story. As an unusual candidate, I think it was extra important for me to clearly articulate why I wanted an MBA and how it tied into my career goals after school. I also needed to tie together my career background with my future goals and to create a narrative that I believed in so much that I got excited every time I talked about it. If you’re finding it hard to build your story, I would suggest that you do some introspection to find out what you really want out of school, what skills you bring to the table from your pre-MBA career, and what skills the MBA will give you to help you achieve your goals. I would also recommend doing an audit of your work experience and extracurriculars / activities to identify some personal characteristics to highlight in your application. For example, the themes I identified were mentorship, teamwork / collaboration, execution, and passion. I made sure that those personal qualities were highlighted in the different parts of my applications. It might seem weird to go through and formalize your qualities like this, but if you spend some time thinking about these common themes, the stories and application materials you develop will start to naturally converge around them. Knowing your strengths, weaknesses, and story back and front will also help you when it comes time for interviews. You can follow Jackie’s story by checking out her blog at TV to MBA . Thank you Jackie for sharing your story with us – we wish you loads of luck!